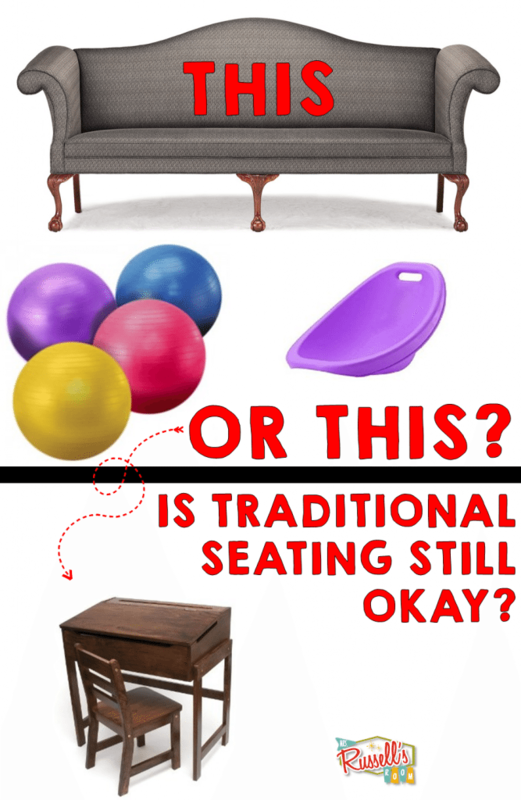 Traditional Seating Is STILL Okay! Over the last few years that I’ve been blogging, I’ve seen an increase in what I consider ‘faddish’ types of pedagogy and or practice. I’m going to tell you that I think alternative seating falls into that category. I am an advocate of alternative seating. Let me tell you how. Boys and girls…come to the carpet. Boys and girls…get into pairs somewhere in the room to work. Boys and girls…let’s do our DEAR time outside. You know what each of those examples were? ALTERNATIVE SEATING. You know how long teachers have been doing alternative seating? FOR EVER. It’s not new. It’s old. You know what IS new? Doing it with cute Pinteresty DIY projects, couches from the thrift store, Rubbermaid tubs that folks cut the tops off of to let kids sit inside and still have an area to write on. Trying to make our classroom look like a house or a coffee shop. These are the things that are ‘new’. Let me tell you, after 20 years of teaching…I can tell you that your students will still learn without all the bells and whistles that you see out there. Simplifying and streamlining my practice over the years has taught me that sometimes, less is more. This is not to say that if you want to have nice things in your classroom you shouldn’t. Go ahead and do them! Your students will appreciate the touches in the room that are uniquely you! I’m just saying if you are a newer teacher, or a teacher without the means or the time to try to put together grant proposals, you can still teach. Do NOT buy into to the FOMO that is occurring in our profession. If you don’t have the money or the time..your kids can still learn. Love and consistency still works with kids of all ages and all demographics. Majoring on how to build relationships never gets old, and always helps kids to feel more connected to you and what you’re trying to convey. One of the things that I think is not as clear as it should be with these types of concepts is that your management has to be really strong. The more autonomy you give your students, the better you have to be at setting up procedures and being consistent with them. It took me YEARS to feel like a ‘good manager’. I think that’s true of a lot of teachers. I think another thing that is not emphasized enough is that these types of ideas are not for every type of student. Just like desks and chairs may not be for all students either. At the end of the day though, no student is going to be asked to sit on a yoga ball while doing a job interview, but they will need to learn how to sit in a chair and talk without showing their nerves. There are lots of ways that we can give kids autonomy and choice without changing the furniture. The bottom line is those kids are going to be taking standardized tests in sterile environments where they all have the same seats. Kids have to get used to the fact that they have to perform important tasks in settings that may or may not suit them. So, what are some things that I have done with students to keep the learning engaging and help students who need more movement participate in a more tangible way? Gardening – This is a great tie in with science standards and a great way for students to do something tactile. Building Things – We’ve done several different types of projects where the students worked in pairs or even individually to complete engineering tasks for STEM. The students really enjoyed this and often I had to allot MORE time for them to work. Set Fitness Goals – If you ask your students who the fastest kid is they will know. They always know. Setting physical goals for them are a great way to help them work towards something that will burn off some of that energy. Talent Shows – Kids love to show off what they can do. There’s nothing like hearing little folks play the flute, or sing a song! Genius Bar – This is a great way to have kids become an expert at something and share it with their peers. I love watching my students teach each other something that they are passionate about. These are just a few examples that came to mind. There are plenty of others out there that I will be exploring for my learners this year! Remember, good teaching starts with love and your standards. Loving your kids and building relationships is the lasting impact that will make a difference in your students’ lives. I love your point of view on traditional seating. I have to say, I have offered “alternative” seating options in my classroom for 20 years. I think that just like there are different learning styles, there has to be a balance. I did have stability balls in my first grade classroom and quickly learned they weren’t for everyone. My kids had choices and if they didn’t like them, there were chairs available. I have used my teacher’s desk as a standing work station for centers. However, too many things in education swing from one side to the other. Alternative seating should not mean throwing out all desks and chairs and replacing them with all couches. (I just think of lice multiplying there!!) I think of their posture as they aren’t made to sit up straight. It simply means having some other options available and YES, kids still need to know how to sit down in a chair. Thanks for opening up this discussion. My concern with these rampant trends and the impact of social media and Pinterest is that younger teachers are starting to implement these things without all of what they need to be successful. There’s WAY too much pressure to adapt to some of these refurbished ideas and not enough discussion on why they are relevant–if at all. I had a couch in my classroom in the early 2000’s when I taught middle school. Making the environment ‘homey’ was suggested then as well because it was a second chance school. So, I get it…I do…but as you mentioned…there must be BALANCE, and from the most ardent supporters of this trend…I sense that we’ve got to ‘get with the times, now’…rather than seek out a balanced approach. Just because the idea is ‘out there’ doesn’t make it researched based…doesn’t mean it helps teachers become more efficient…doesn’t make the teacher better…without truly understanding the implications of the management and the drive to make these systems work for kids in a way that makes them better learners in the real world. Totally can relate to this post. I spend in the 500-1000 range just for supplies my kiddos have to have each year. I’ve taught for 30 years, so it adds up. I love to keep up to date with all that is new out there. This is an area though where I have put my foot down in the spending. The school supplies my tables and chairs. I’ve bought many storage cubbies, book bins etc. If my district can come up with the funds needed for alternative seating I’m in to a degree that makes sense for Kinders. Thanks for writing such a timely article. So I agree with all of the comments so I think that means that balance is the key. I had never heard of alternate seating or the literacy methods that go with it until this year. One friend just jumped right in and it was a mess. I took a more wait and see approach and had pretty good results. I think that the important thing is to look at our students as individuals. This fall I will have more choices for alternate seating but will have table seating for many. That said, I’ve been teaching for 12 years and do pretty well with management. A new teacher or one who is experiencing chaos should never try this right out of the gate. And everyone should stay off Pinterest. All that does s make us feel bad. Very well stated! I love sharing and seeing what’s going on in classrooms on social media, but there can be a major feeling of FOMO or inadequacy when my stuff doesn’t look picture perfect. You bring up a great point with students needing to know how to sit in a desk when it comes to those standardized tests. Love the new Word Press design! Thanks for the love on the new design! I am so excited!! Thank you for this blog topic! I have been feeling this way about so many of the “trends” and specifically this year about seating arrangements. After 16 years of teaching (secondary and elementary) I have started being more vocal about the fact that teachers are told to differentiate for each child, yet administrators are not allowing the same differentiation in teachers’ classrooms. Not every classroom on campus needs to be in Kagan 4-desk grouping. Like you, my students have many, many opportunities to collaborate and synergize together. Each year, we get new students who are unique and with different personalities than the previous year’s students, so what worked last year, may not work this year. It is my responsibility to find what works best with each new group and do that. Thank you again for this blog and letting the new teachers know that they really do not have to jump on every new trend, it is okay to trust their instincts and use what works best for them and their students. Thank goodness. A voice of reason! I’ve been teaching for over 25 years and have seen so many things come and go. Each time they come they have a different name and a new set of ‘you beaut’ resources to go with it. As I get older I am turning towards minimalism. Our over stimulated kids need some slow, consistent teaching. Often they need no choices and some firm rules. I see a lot of young teachers buying so much ‘cute stuff’ for their classrooms and I think to myself in a few years that is going to be nothing but more clutter you have to deal with! In rereading this I realise I sound like an old grouch! I would like to think of myself as a wise realist!! I feel the exact same way. I have always had lots of energy and joy in the classroom. I LOVE being a teacher. I hate feeling like a wet blanket. Frankly, sometimes, it stinks to be the voice of reason! Lol! I just know that I want our rookies to be successful at the nuts and bolts of the craft. They have such wonderful energy! I admire that! Just want to help guide that in a different direction. Thanks for your comment! This is a great blogpost and very well stated! I feel the same way! I allow my students to sit, stand, or get a clipboard and lay on the floor (I keep a class set on hand). I think these are enough variations and I don’t have a big investment or huge storage issue. 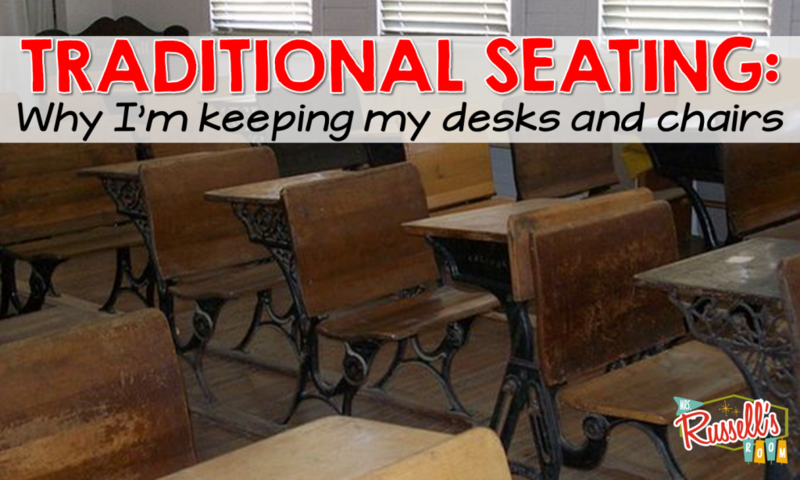 I see teachers eliminate all traditional seating options and I worry about back support! Thank you for validating those of us who have been offering flexible “seating” options all along! Girl…yes! Back. Support. Oh my soul…especially with littles! As veteran teachers it is so important that we encourage those who are coming behind us…and sometimes challenge trends that we know should be nuanced. This is one of them. Thanks for the affirmation!! I’m all about choices in my classroom. To that end, I feel like many followers of “alternative seating” have missed the point. Putting everyone on a fitness ball isn’t creating alternatives, it’s creating a new normal. I address alternative seating through use of choices. For example, when we come to the carpet, not everyone has to sit “criss cross”. Some sit criss cross, some sit with their legs stretched out. Others prefer to stand or kneel. The exectation is that if you kneel, you sit behind the students sitting on the floor. If you stand, you stand in the back. This allows everyone to be comfortable and see. The same thing goes for working. When I give an assignment, I also tell them where they can work. They can work at their desk, lay in the floor, stand at the window, etc. 100 times, YES!! THAT is what I am talking about!! Love how you shared about your carpet time!! Fantastic!! I would much rather hear ideas on autonomy that can be replicated for free! That is still giving choice and maximizing your personal time in a constructive way. Love it!! Thank you so much for this post. I have been struggling these past few weeks to determine whether or not I could do this in my classroom. I love all of the cute things, but I have noticed the same thing you said. The students still learn whether or not your room is super cute. Sometimes I feel like all this stuff can be a distraction for students. Thank you again for this post and I will be thinking about it a lot!! Yes! I also would add as a mom with a child that has some visual issues that effect his learning in school… This is a huge thing we are doing without knowing other things we might be causing. Students need that good posture, they need the correct distance for their eyes to see properly (Harmon’s distance) so they are not causing their eyes more fatigue, better tracking, etc. which help with improved comprehension… What my son “needs” might not be seen on the outside, because on the outside you think he needs to get rid of energy, but the truth is his eyes need a little help! Thank you Thank you Thank you for voicing my opinion exactly! Thank you for always beginning meaningful, thought provoking discussions…love your perspective! BALANCE is the key word! 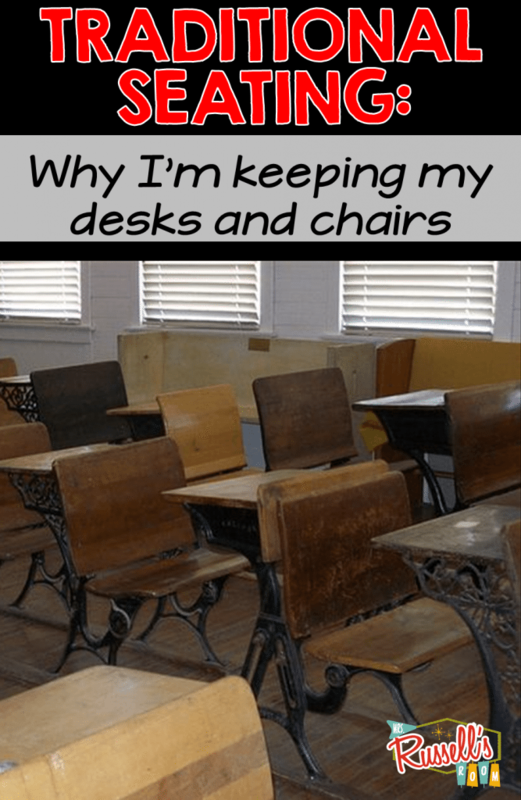 I love this post – moreover, I love that you allow for people to feel good about who they are as a teacher – with or without “alternative seating”. What bothers me is the shaming that often happens when people choose not to jump on board with the current trends. I’ve seen posts where people are told that they are less of a teacher if they choose not to implement “alternative seating” the way certain teachers deem to be the “right way”. After you’ve been around the block a few times and you’ve been in this field for a number of years, you start to embrace the notion that using your professional noggin is what should be celebrated – NOT that you’ve chosen to do what everybody else is doing simply because it’s “what everybody else is doing”. Now, if you really do believe strongly in an idea, by all means, go for it – if you BELIEVE in it – BUT…do not doing something just because somebody told you that you should or that it’s what THEY deem to be best practice. We are professionals and can decide for ourselves what we feel to be best practice in our OWN classrooms. Thanks SO much for posting this!!!!!!!! Well said, Holly! I totally agree. I agree we must offer options and not just our preference. I have stability balls and chairs in my classroom, the children always have a choice on seating. We are also tasked in getting children prepared for the next grade level and if we are too free in our classroom how does that prepare them for the next level. Thank you for your voice of reason and letting new teachers know we don’t have to be one way or the other. I have taught for 12 years now. I am the mother of a child that struggles to stay focused. He is in middle school and happens to be a straight A student. Of course I have had to teach him how to stay organized and have given him tips on how to stay focused. Why do I bring this up? Well because the best year he ever had in school was with a teacher that used flexible seating. I have taught per-k through second grade. Most of my kiddos are bouncing balls of energy. I have always done the carpet time, the work on the floor with a partner, and the quick 2 minute stretches and brain breaks. BUT last year I gave my students the choice of where to sit the entire second have of the school year. The results were amazing. Behavior disruptions caused by off task behavior decreased considerably. Their on task/ staying focused time increased. Their handwriting actually improved and their academic performance improved as well. YES, I had to set VERY clear expectations. YES we reviewed those expectations EVERY morning at carpet time before they were sent to choose their seat for the day. Also, if they had not met my expectations the day prior, they were NOT given a choice of where to sit. But with that said, I rarely had to take this privilege away. About a month into it, the kids had pretty much decided what worked for them and what didn’t. Some students chose the traditional seating every day. Others were always on a yoga ball or lying on the floor with a clipboard. Some would stand behind a desk in the morning and sit in their chair in the afternoon. My point is, yes traditional seating will always be there. But there is nothing wrong with a teacher trying something new. If it doesn’t work, no harm done…just go back to the way you did it before. I also believe that teachers that choose alternative seating should NOT make a peer feel as though it is the only way to teach. It is also important that traditional seating be available for those that choose it. It worked well for me, so I am going to share that with other educators that would like to try it. I hope to continue to see teachers try new things throughout the years. Our world isn’t the same as it was so why should our classrooms have to be? I love what I do and it sounds like you do as well. I hope that we can continue to encourage our peers for the hard work and time they give their students and not focuse so much on “whose way is better”. Just continue to teach your students the best way you know how and always keep their best interest at heart. You made some valid points that I did not make. Chiefly the amount of work you yourself did as a parent to make sure that your student could overcome the challenges they had with regard to attention and focus. I am glad that it worked in your construct, and I think I made the point that in some cases this will work with the right teacher and conditions. That said, as a mentor to rookie teachers, I would much rather them spend time on how to build relationships with students of diverse background and planning high engagement activities for their students that will ensure that mastery is achieved. Spending time on seating when there are plenty of options in the classroom to provide movement seems to not be the best use of their time. Many of our teachers with under five years of experience are often switching rooms or even grade levels every year or every other for a while. It’s hard to figure out what to teach, how to teach it…how to manage it…with all the visual pressure of Pinterest and social media. I’m looking at what we currently have to minimize stressors for young teachers I mentor. We usually have only one year to make an impact on a child. I don’t know that I can agree that if I blow it one year with a new management structure there is ‘no harm done’. This is especially true when you are working in classroom constructs with students who have experienced long term difficulties with academic failure. This post is not about NOT trying something new. It’s about knowing that you can work with what you have…and that’s okay for as long as that is needed. This post is about giving grace to folks who ARE providing choice and autonomy to students but may not have the money or the time to do it in some of the more ‘photo worthy’ ways that are currently being promoted. Thanks for your comment. I 100% agree that new teachers need to focus on the children first. I 100% agree that new teachers often try to take it all on at once. You are correct. Starting your teaching career and focusing on teaching and not on all the bells and whistles is a smart plan. I feel like it was really more of the comments that fellow teachers were leaving in regards to your post that made me feel that the concept of alternative seating was at debate. Also, on a side note when I said “try it” and ” no harm done” my brain was thinking try it for a month and then go back to the original way. I hope a teacher would not commit to a year of trying something if they could clearly see it wasn’t working. ? P.S. Thank you for your reply. I appreciate it. I love this post! You have said so well what I have been thinking all through the newest trend toward alternative seating. I have offered options for many years, with the bucket seating as the latest addition to my small group table. Mainly because it helps my students sit high enough to work easily during our guided reading time. You do need a strong management system for flex seating, especially for the youngest students. Thanks for this! Experienced teachers have always used “alternative” seating!! We also implemented versions of Daily 5 before it acquired a name! You are a voice of reason. Thank you. I agree with you about keeping and using traditional seating, while still offering alternative learning areas, and styles, including alternative seating. I can see one option for alternative seating, without having or using a lot of fancy things. I’ve seen such simple alternative seating ideas, such as allowing students to work on the carpet with a clipboard or a small table during independent or group work. Or like you said, doing your DEAR outside, or doing a scavenger hunt or doing a guided STEM activity in another area of your school or if your classroom is larger, in that classroom.